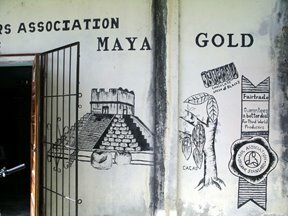 This winter, Clay Gordon, author of Discover Chocolate (Gotham Books, October 2007) is leading a chocolate adventure in Belize. So far, the week long itinerary includes hands on activities such as harvesting cocoa, splitting pods and roasting and cleaning cocoa beans. There's also some snorkeling, a visit to Mayan ruins and a few parties. You'll stay at the Cotton Tree Lodge, an eco-friendly jungle resort which is co-owned by a New York Metro Discover Chocolate Meetup member. For more info click here. Now this is the kind of candy I'd like to see in my basket! 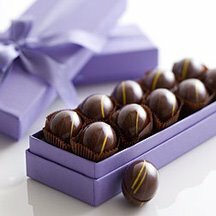 20 dark chocolate eggs with creamy 65% dark chocolate ganache centers have been artfully hand crafted by the San Fran savants at Michael Recchiuti's flagship. I think I'm in love with the presentation alone. 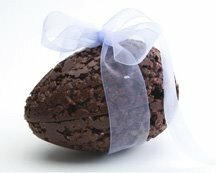 Cocoa Locoa's dark chocolate and crispy rice egg for Easter looks pretty yummy. It comes in milk chocolate too. 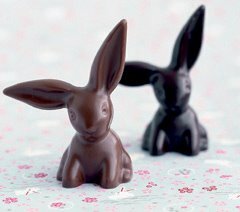 Pretty original, although their bunnies look strikingly farmilliar to Vosges. I wonder who got a hold of the mold first? The spring equinox has been a time of transformation, balance and celebration for centuries. 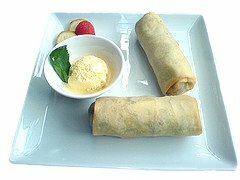 I plan to observe in style with Chocolate Spring Rolls from Food & WIne. Cheers! Lemberger Candy Corp. churns out everything from chocolate bandaids to pianos. 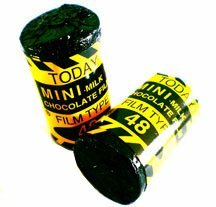 I suggested a friend include these half ounce milk chocolate films in the goodie bags for an upcoming photography exhibition. She says it's too hokey, but I stand by the idea. The chocolate tastes like Hershey's more or less, but sometimes it's all about the keepsake. I've never been a fan of Easter bunnies. The hollow mass of oversized commercial chocolate has always seemed superfluous. Yet thanks to Vosges' sensible alternative, I will indulge. I plan to pick up a few of these adorable little Naga Bunnies for myself and a few for my dear best friend who I have yet to convince that curry and chocolate is a brilliant thing-- and especialy when there's coconut involved. 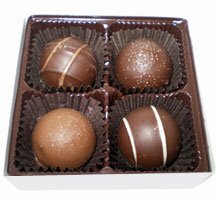 I picked up a four piece box of Lake Champlain's Small World truffles at a local grocer. 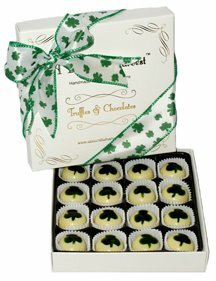 The milk and dark truffle's creamy ganache centers are flavored with Mango, Chai, Mole and Lemon Ginger. They left me longing for the southern hemisphere or atleast for Indian, Mexican or Thai to wash it all down. 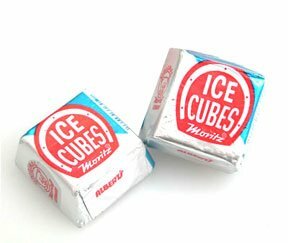 My mom used to bribe me with these bad boys. And I'll tell you what, they're delicious enough to tame even the most unruly child. 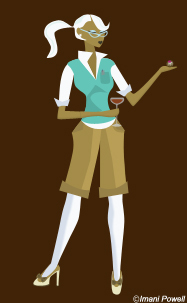 The milk chocolate is so completely smooth that it almost instantly dissolves on the tip of your tongue. So you have to trust me when I say that they're absolutely worthy of your very best behavior. On March 6th, New York based chocophile Clay Gordon is teaching a non-credit course at NYU on comparative tastings and pairings of wine and chocolate. He's super knowledgable and a lot of fun. Plus, when else do you get to stumble away from class in a drunken stupor?